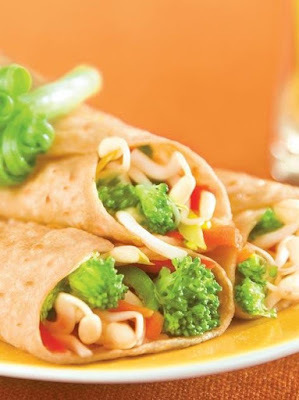 Sprouts and veggies wraps are very delicious snack recipe which you can enjoy at any time. This recipe is full of nutritious qualities as it is made with fresh veggies and sprouts. Sprouts are very good for our health and the various veggies which we are going to use in this recipe is also provide different vitamins to our body and it's very healthy to every age group. Add the chopped garlic to the heated oil and roast for sometime on medium flame. Now, add chopped onion, chopped capsicum or broccoli, sprouts and chopped carrot into it. After 2 mins add salt, black pepper and chilly sauce. Mix all the ingredients well. Now, add grated cheese into the mixture and mix it and switch off the flame. Let it cool down for sometime. Take one chapattie and 1-2 tspn of sprouts mixture and spread the mixture over the chapattie and roll it well. Make all the rolls like that. Now, heat the pan and spread 1/4 tspn oil all around the pan, stew the chapattie till golden brown frowm all around. Stew all the chapatties and then, serve hot with tomato sauce.